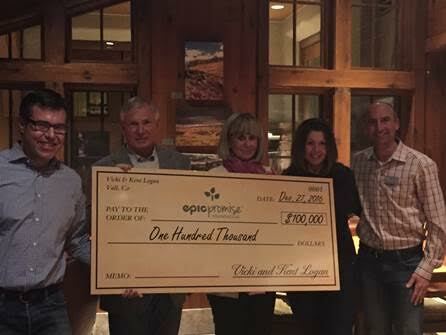 After calling the Vail Valley home for nearly five decades, Kent and Vicki Logan have made a generous contribution through their will to the EpicPromise Foundation, The Logan Scholarship for Vail and Beaver Creek Instructors and Small Champions, three programs committed to enriching the ski and local mountain community. Kent and Vicki Logan (center) present a check to the EpicPromise Foundation. From left to right: John Weiss, Rob Katz, Kent Logan, Vicki Logan, Nicky DeFord and Bobby Murphy. Kent has been skiing Vail Mountain since the mid-1970s, not long after the mountain’s inception in 1962. Having lived across the United States, from New York to Arizona to California, Kent has always considered Vail home. So much so, he and wife, Vicki, were married atop Simba trail in 1985 and purchased their first home here in 1994. During the course of his long tenure with the town and the mountain, Kent served as Town Councilman from 2003-2007 and worked closely with partners such as, Dave Alonzo, Randy Nelstead, Joel Fritz, Mark Miller and Connie Miller to enrich the strong ski traditions of this Valley, specifically when it comes to the Ski and Snowboard School. When the EpicPromise Foundation was launched in 2016, Kent saw an opportunity to help people who were invested in the ski industry. On top of the Logan’s contribution of $1 million in their will they also gave a $100,000 donation to the foundation. Through EpicPromise, Vail Resorts contributes $7.6 million per year in charitable donations to 250 local nonprofit partners, contributes nearly $1 million to local stewardship projects with funds raised through the guest donation program and the Company’s “1% for the Forest” commitment, and organizes more than 20,000 hours of Company-sponsored employee volunteer time. Vail Resorts founded the EpicPromise Foundation to provide financial support to Vail Resorts employees in their times of need or to pursue an educational goal. In its first year, the Foundation granted 226 grants totaling $466,255. Kent’s idea of sending instructors to the National Academy came about in 2002 with the help of Dave Alonzo and Mark Miller. The Logan Scholarship for National Academy provides continuing education and professional growth for Vail and Beaver Creek instructors through their participation in the PSIA-AASI National Academy. Kent’s involvement with Small Champions goes back a number of years as well. Mark and Connie Miller were the driving forces behind the program and Kent said it was a logical and natural merge of interests between ski school and what the Millers were committed to offering to children with disabilities. Small Champions is a local Eagle County charitable organization providing year-round sports programs for children with disabilities. Small Champions strives to introduce a wide variety of sports to each of its participants. In addition to skiing and snowboarding, programs include swimming, horseback riding, gymnastics and golf. Small Champions teaches children with multiple disabilities that life is a rich and exciting place, if you focus on abilities, not disabilities. Small Champions provides an opportunity for these special children to be part of a group that meets often to enjoy sports, grow, learn, and have fun. Through the guidance and support of Kent Logan, Small Champions is positioned for the future to continue to enhance the lives of the special needs children and their families in our community.